The Mercersburg Library Association, Inc. The Fendrick Library houses an assortment of records of the local area going back to the earliest time that the area became settled. Following is a listing of many of those records. As time goes on, we will attempt to make many of these records available on line. If a listing appears as a link, it will take you to the record. We would ask that if you make use of these records, you can show your appreciation and help us to defray the costs of maintaining the information by making a donation to the Fendrick Library, 20 N. Main Street, Mercersburg, PA. 17236. We are a non-profit 501c(3) and your donation is tax deductible. If a listing does not appear as a link, it has not been made available on the internet as yet. In that case, you will have to visit the library to peruse the files. However, research of the records can be arranged for you. The cost of research on your behalf is $20.00 per hour plus the cost of any copies made for you. For onsite research by you, there is a $10.00 per day charge assessed. All indices found hereunder that are the work product of Jim Houpt are Copyrighted Material of Jim Houpt with All Rights Reserved. The indices are provided to our patrons under agreement between Jim Houpt and the Fendrick Library for viewing only. Any printing of these materials including digital copies is strictly prohibited. All copyrighted material found hereunder that is the work product of Mrs. H. Virginia Smith is Copyrighted Material of H. Virginia Smith with All Rights Reserved. These materials are provided to our patrons under agreement between H. Virginia Smith and the Fendrick Library for viewing only. Any printing of these materials including digital copies is strictly prohibited. Palmer Papers Index- Records of early families living in the area of Welsh Run, PA. Copies of the Palmer Papers files are maintained in our History Room. The Index found here was compiled by James Houpt in 2008. Copies of the Index are available from James Houpt. Harry Foreman Books and Index - Franklin County PA. history. A copy of the Harry Foreman Books is available at the library. The Index found here was compiled by James Houpt and lists all the names found in the Foreman Books. Copies of the Index are available from James Houpt. Naturalization Records of Franklin County, PA.
Virginia Fendrick Notebooks and Index - 25 volumes of genealogical research. A copy of the Virginia Fendrick Notebooks is maintained at the Fendrick Library. The Index of the Notebooks found here was compiled by James Houpt. Fendrick Collection - early deeds, letters, land grants and correspondence relating to Mercersburg, Peters, Montgomery and Antrim townships. Seth Dickey Documents - pertaining to his Civil War service, men who served with him, local land warrants and deeds. Kittochtinny Historical Society Papers - an index to the Kittochtinny Historical Socity Papers created by James Houpt. The papers are available for examination at the Fendrick Library. American Revolutionary War Soldiers of Franklin County Pennsylvania - a book edited by Mrs. Virginia Shannon Fendrick listing participants in the Revolutionary War who resided in Franklin County Pennsylvania. The book is available at the Fendrick Library. The Index of names found here was created by James Houpt and copies are available from him. Family Records - An index of information available concerning families that were local to the area around Mercersburg. Scanned copies of the original documents can be viewed at the library or ordered by contacting the librarian for copies at 717-328-9233, or at fendricklibrary@comcast.net. Newspapers - An index of local newspapers held at the Fendrick Library in microfilm and also in searchable digital format. These documents are in .pdf format. You will need Adobe Reader to view them. If you do not have Adobe Reader on your computer you may go to the Adobe Reader link below and download a free copy to your computer. Simply follow the instructions on the Adobe download site. 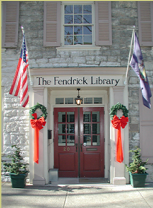 In addition to the records and documents listed here, the Fendrick Library also maintains a collection of the Mercersburg Journal, the local newspaper, going back to 1846. The newspapers are also kept on microfilm and can be viewed in and copies made on our microfilm viewer.